Something remarkable happened this year in Davos - a real clash between those who want to drag the world backward and bring it back to the entirely male dimension of raw power, and those who want to move up it to the next civilisational level, where a tangible technological, economic and societal change is about to happen. Progressive vs regressive. The contrast in this year's special addresses of global leaders was huge. 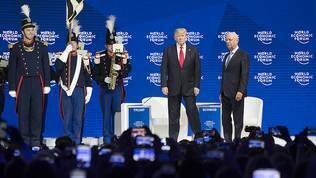 Illiberalism in the past years has significantly grown but the World Economic Forum in Davos this year showed that liberal forces are still alive and kicking. Three bright representatives of the liberal world threw the gauntlet to political leaders and business elites - Canadian Prime Minister Justine Trudeau, German Chancellor Angela Merkel and French President Emmanuel Macron. 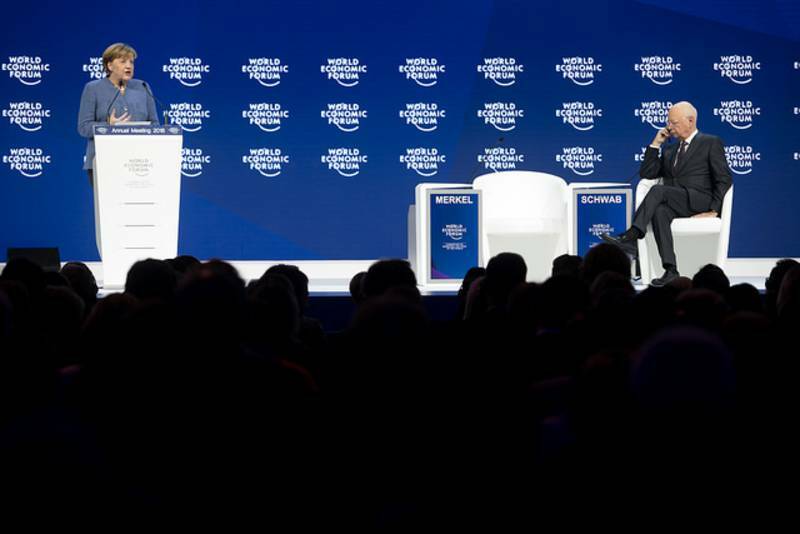 One of the events at this year's World Economic Forum in the Swiss ski resort Davos was the return of German chancellor Angela Merkel at the forum itself after a few years pause, and also on global stage after the parliamentary elections in Germany in September, which led to prolonged coalition negotiations that have just ended successfully. After Donald Trump's election as president of the USA, with his illiberal world views, Angela Merkel was proclaimed a leader of the liberal world. This was before Emmanuel Macron won the presidential elections in France after a contested battle with illiberal nationalists, and before Justine Trudeau conquered the hearts of liberals around the world, especially their female part. After the elections in Germany, however, which ended without a clear winner and with strong gains by the nationalist party Alternative for Germany (AfD), talk began of the end of Merkelism not only in Europe but in her very own party where preparations are ongoing for the time when she will no longer be a leader, as well as for her successor who will very likely be another woman. 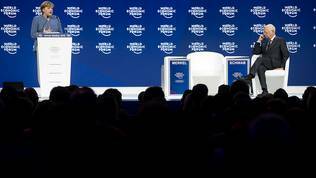 Her speech in Davos showed, however, that Merkelism, as a political and social stream with a European and even global dimension, might not leave with Merkel, elated by the Macronism, and, across the Atlantic, by the Trudeauism. All these name-isms are justified as the three leaders symbolise the evolution of the 20th century ideologies and economic streams, and the need of their upgrade to adapt them for the 21st century. The three leaders swim against the current of illiberalism, anti-globalism and corporate libertarianism but they seem ready to play their parts adequately in this historic moment. As a result of the growingly intenser civilisational clash and the change of poles in geopolitics, Europe was forced to take the role of a global leader in terms of values, trade and in a military sense. Last year was a very fruitful year for the EU because a crucial decision was taken to build common defence, but there was also a change in terms of trade agreements which are no longer entirely about trade but cover a broad range of issues, including democratic values, human rights, climate commitments. The clash of values is most tangible within the Union itself, where ever more clearly is seen the dividing line between illiberalism and the European liberalism, going along the lines left by the Iron Curtain. The return of hate speech, the fight against those who are different, the suspension of rights and liberties gained after bloody wars are something that is turning Europe into a major theatre of this civilisational clash. About how serious the internal European tension is, and how high the stakes are spoke Angela Merkel's address in Davos. She appeared in the covered by snow resort in her typical modest outfit, consisting of dark pair of trousers and the quite familiar fashion of her coat (light blue in colour), her usual scanty quantity of makeup, the familiar hair-style and, maybe, just a few more wrinkles than before. Although, at a first glance, she was the same old pastor's daughter she still looked somewhat different, new - ideologically younger or rather elated, but also wiser, having learned the many tough lessons during her 10-year rule, and as if finally having accepted the role of a leader of the free world. In her speech, she made several significant things. She admitted Europe's sins, she looked into the future, and called for making a plan. "In 1918, one hundred years ago, the First World War came to an end, which is called the 'seminal catastrophe of the 20th century'. Even a worse catastrophe was about to follow. In a way, the political actors almost sleep-walked into a horrendous situation. And we today, a hundred years later, have to ask ourselves, when we have less and less people who have actually witnessed this time of the WWII, we have to ask ourselves a very pertinent question: 'Have we, actually, learned the lessons of history?' And I think we haven't really'", Ms Merkel said before an audience covered in dark and barely illuminated by the light from the podium. An audience which may have not yet watched another German TV masterpiece - the TV series Babylon Berlin - which covers exactly this interval in German and European history - between the First World War and the Second. 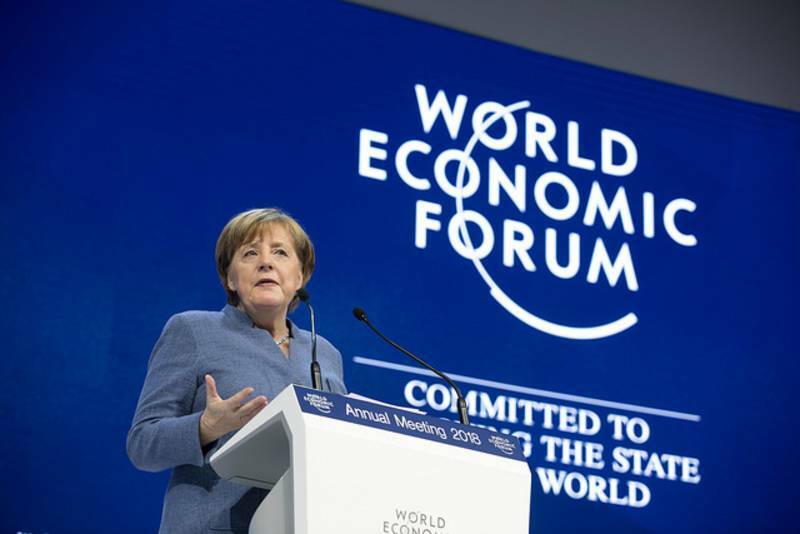 The German chancellor recalled the slow and gradual construction of a new multilateral world based on international institutions, and stated that despite polarisation within her home country it would be a mistake to move toward self-isolation from the rest of the world, especially in the context of the "the great challenge to mankind - climate change". Her message had a very specific address - the White House - but it could well be aimed at others as well, including in Europe itself. Polarisation and the growth of illiberalism, to a large extent, owe their "success" to the digital world. Social networks, and especially Facebook, are often criticised in Europe. To Angela Merkel, the digital world has been one of the most important and even the most important issue in the last two years. After each EU summit she speaks primarily about how important digitalisation is. At the last European Council in December, she said that many people actually underestimate how important digitalisation is and what impact it could have on our economies. 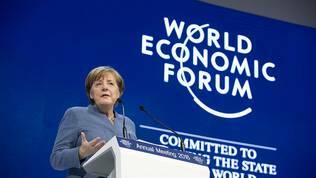 And in Davos, she admitted that Germany (but also Europe at large) is not leading in forming the digital world regarding society and the state. According to her, the coming years will be dedicated on digitalisation of educational systems and states in general because, "At the same time, we know digitalisation means that there has to be life-long learning, we have to deal with completely new solutions as regards our social systems. That is to say we have to be aware of the fact that these disruptive technological changes invariably mean disruptive changes for our societies". She stressed on another problem - ageing population which raises the issue of society's preparedness for a change because, as she said, it stops being curious. "Data will be the raw material of the 21st century. Data are the raw material of the 21st century. And the question who owns these data will decide in the end whether democracy, participatory social model and economic prosperity can be combined", added Angela Merkel admitting that Europe still has no answer to these issues neither a strategy. "The danger that we are left behind, that we are too slow, that we'll be overtaken by events, that we are debating philosophical issues is a big one", she said. According to her, it is possible the European model of social market economy to live in a digital age as well. Her words, not only in Davos, make it clear that digitalisation will turn into the priority for the EU. France and Germany are already working on a common AI research policy. "I feel we are under pressure. And a sense of urgency may not be broadly developed in a lot of parts of Europe", Ms Merkel added. Angela Merkel again spoke about one of the most sensible issues which marked her third term - migration and the deep division it caused in Europe. With her statement in Davos she made it very clear that she had not changed her stance, on the contrary. In the spirit of the beginning of her address, she said that stereotyping is the most dangerous thing. During the euro area crisis people started naming the Greeks as squanderers, the Germans as tightfisted, the Americans as protectionists by nature. "The next thing is Muslims are like this, Christians are like this. You have to look at every individual. It's a lot of work. But as long as you do not respect each and every person's individuality, and already have your preconceived notion about the person before you that is the very basis of populism", Angela Merkel emphasised and the silent audience responded with strong ovation. 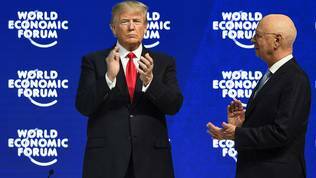 Against the backdrop of the ever more frequent forecasts about the end of Merkelism, in Davos this year we saw a new, mature, globally oriented Merkel who showed an ambition to fill in the vacuum left by the US on global stage. This new Merkel was possible thanks to Emmanuel Macron, whom she mentioned many times as a reason for her change but also as an ally in the future formation of Europe's global answer. 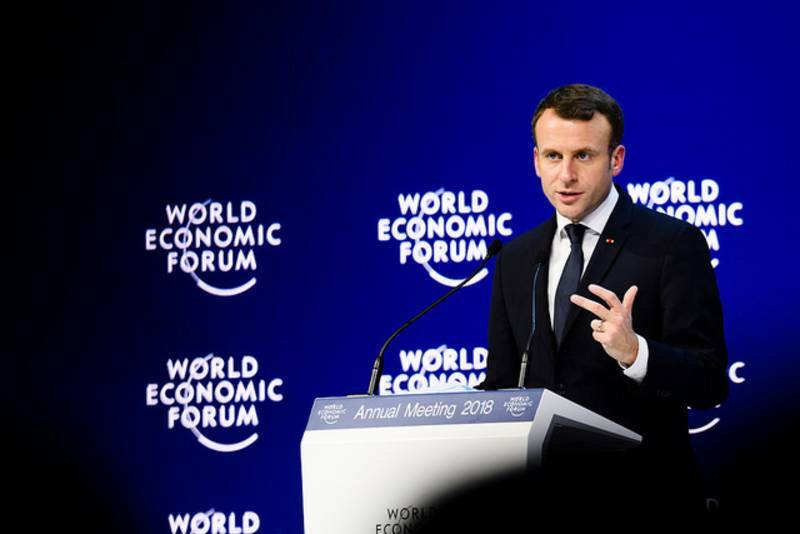 The big event of Davos this year was Emmanuel Macron's speech. Speaking for an hour the French president managed to address simultaneously the world, the business elite, Europe, and the French audience. He spoke half the time in English and left an impression that he holds the key to all global issues in his hands. Key which he clearly said can be found in Europe, part of which will be a completely renewed France. In fact, he did indeed offer solutions to many of the problems - education as a national and foreign policy; turning Europe into an economic, social, green, scientific and political global power, and not necessarily of the 27 at that; rethinking the philosophy of economic growth; striking a global compact. 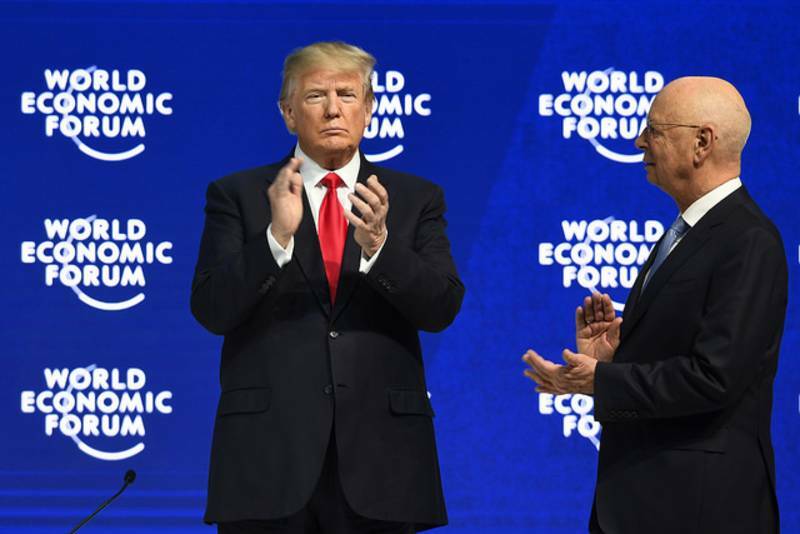 He started his speech joking that, thus hidden under snow, Davos is probably not the most appropriate place to discuss climate, and thanked his hosts for not having invited global warming sceptics at this year's forum. This caused loud applause and laughter. However, Macron was not right. 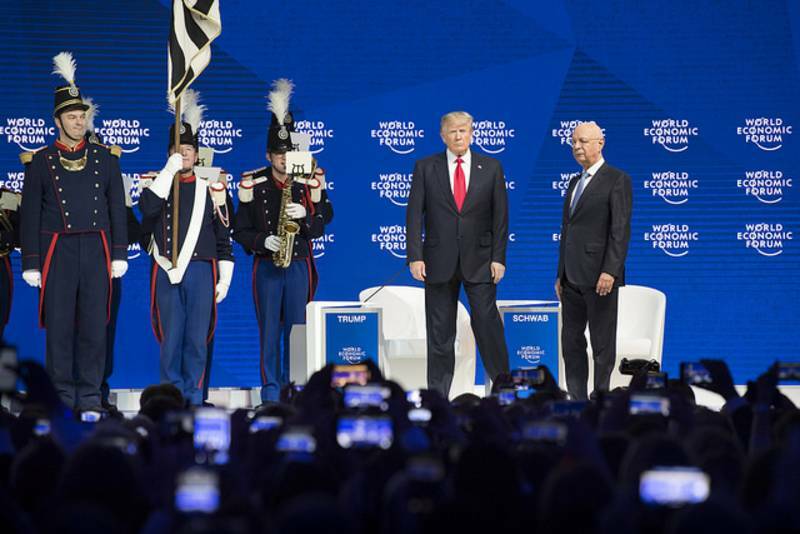 The World Economic Forum boss and host of the meeting in Davos, Klaus Schwab, not only had invited the symbol of climate sceptics - US President Donald Trump - but even welcomed him with Swiss military band, which is really rare for the Davos spirit and traditions. Initially, one could think that the performance Mr Trump visibly enjoyed feeling in the role of an emperor was organised to underline precisely that sharp contrast between liberalism and illiberalism. Mr Schwab's introduction before giving the floor to the US president, however, left no illusions that he supports the American president's policies. He praised Donald Trump for his tax reform and thanked him for it. Schwab himself was not a host of Emmanuel Macron's address but was among the audience. The French president spoke just a few hours after Angela Merkel and several days before Donald Trump. He divided his speech into three parts. First, he spoke about what is France doing to return on global stage. Then he spoke about Europe, and in the end about the world. He spoke in detail about the reforms his government has undertaken, focusing on education. "Our world has changed and today we need definitely less arms and more brains. Educated people". France launched an in-depth education reform after it significantly dropped in global educational ratings. France invests 5% of its gross domestic product in education, and, in addition to that, by the end of the mandate, further 15 billion euros will be invested. Apart from that will be created a fund for financing development and disruptive innovations programmes amounting to 10 bn euros. He urged the business elite in Davos to help turn education into a global priority. "There is one area where we are not doing enough and that is education. In the world today, we've got 750 million adults, two thirds of whom are women who don't have basic literacy skills. So, if there's one priority for our investments, it is to invest in education, and the education of girls in particular. Because if you don't invest in education there will be no growth in the country. That means we will continue to have a predatory type of strategy. And if we don't invest in education of girls there will be no equality between sexes. We need to invest massively in education. There has to be a private-public partnership here", added Emmanuel Macron. The most impressive part of the French president's speech was his commitment to make France a country from the Nordic ideological axis, which will significantly tilt the balance in the euro area, and will have an impact on the debate between the north and the south. "The main philosophy is to realign France with Germany and Northern Europe, i.e. to have less rules defined by law and much more rules defined by consensus at the branch level. That's a big change. And I think it was very much waited for, decades some time, by many people". Part of this project is to change mentality. He spoke in detail about an enormous cultural change. "France had a strong preference for regulation, laws and taxes. Why? Because we love politics", he said, visibly struggling with pronunciation in English but determined to make his message clear and heard by everyone. Currently, the government is passing a law which will change entirely the relationship between administration, entrepreneurs, and people. "In France, it was forbidden to fail and forbidden to succeed. Now it should be more easy to fail, to take a risk". Paris will work hard to transform the ways business is getting its funding, moving toward capital funding and taking more risks. Risk will be rewarded, he said, and his words were greeted with applause by the businessmen who managed to get to Davos despite the deep snow. 2018 has to be the year of the development of a new 10-year strategy for Europe. His words suggest that his ambition for this, otherwise, quite symbolic document is big. The strategy should par Europe with China and US. The European DNA should clearly be incorporated in the document, which means the relation between freedom, justice, fairness, individual rights. "If we want to avoid this fragmentation of the world we need a stronger Europe. It is absolutely key", he said and again earned applause. The bad news for the illiberal part of Europe is, though, that Emmanuel Macron is in a hurry. "I'm not naive. We will never build something sufficiently ambitious at 27. And honestly it's ... I mean ... I don't want to say it's impossible to build it at 27, it's just that we have to first finalise the work at 27, but we need more ambition", he said describing a European vanguard which can deliver on the most critical issues. EU must change its working methodology so that it will not be necessary all those around the table to go together forward. "If some people are ready to be more ambitious to go further in terms of integration and ambition of what makes you sovereign as a power in this global environment, to defend your values, and interest, let's move". The door will remain open all the time for those who do not want to continue forward but they should not block the most ambitious ones in the room, he said and again received the approval of the Davos audience. He hopes that by the end of the year the 10-year strategy that will make Europe a new global power will be finalised. The economic part of the French president's speech was hardly to the taste of the business elite in Davos. He said that economic growth should not be the objective. "This search for economic growth has sometimes led us to forget what people are prepared to accept in order to achieve it". According to him, capitalism is in a crisis at the moment. In the process of globalisation capitalism turned into a superstar capitalism. That is why distribution of added value is no longer fair. In order for this distribution to be more equitable, a more coordinated approach needs to be developed toward taxation at global level. More work is also needed on gender equality. 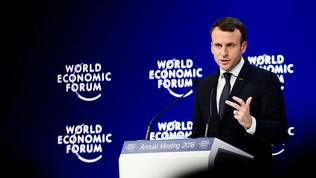 Emmanuel Macron also said that he is willing to support giving the IMF a mandate to review the entire financial system and especially its most deregulated parts in order to bring them to light - cryptocurrencies, shadow banking, the most aggressive operators of financial markets. "So, we've got to have a discussion", he said and proposed the establishment of a global compact which, however, will not be concluded by the governments only. The compact has to be founded on three major commitments: the right to invest, share and protect, although the list is not exhaustive. In order for Europe to be a global power it needs a common foreign policy. This was one of the important messages Angela Merkel delivered in Davos. For the first time she spoke of a common foreign policy during her campaign for the parliamentary elections in Germany in September. "And if we, the 27 mmber states, are not able to send a clear and unequivocal signal, and a united signal to big countries like China, India, US, if our foreign policy is made nationally, and we try to be a player in the world we will fail", she said but admitted that this is still hard to do because member states do not rely on each other a 100%. Angela Merkel also admitted that in the past years Europe was not sufficiently active and often relied for its security on the US. "We need to take more responsibility. We need to take our own destiny in our own hands", she said. The German chancellor made another big confession. "We're responsible for what happens to Iraq, to what happens to Libya. Here we've been hesitant, we've been a little bit reluctant but I think, slowly but surely, we have begun to work on this, and have also had first results and successes". She specifically focused on relations with Africa, especially in the context of Europe's sins from colonial times. "For me this [cooperation with Africa] is personally important because we, as Europeans, have a great debt to fulfil from colonial times vis-a-vis Africa". "The better we overcome divisions at home the freer we will be to engage with others in multilateral fora", Merkel said. A confession came also from Emmanuel Macron's mouth. "Let's be honest! Sometimes we've created solutions that have led to terrorism believing that implies trying to get rid of a tyrant that we didn't like that would solve a lot of problems. You cannot replace the sovereignty of peoples and their sufferings", he said. This statement symbolises the end of one of the most divisive policies in Europe - the approach toward authoritarian states and involvement in conflicts. The first big division in the EU came with the US-led invasion in Iraq when the US created a coalition of the willing. Then, the new member states reluctantly boarded out of fear this could negatively impact their EU and NATO aspirations, but they never forgot that. Even today, new Europe, as described by the then secretary of defence Donald Rumsfeld, is holding old Europe to account that by interfering it is only creating problems which it later requires all of the member states to handle. This rhetoric was especially dominant during the peak of the migration crisis. Emmanuel Macron's vision is that terrorism cannot be fought in a country without having prepared a development strategy. 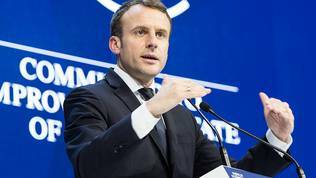 And as trade policy is now an inherent part and even a foundation of EU's common foreign policy, Macron said EU should not conclude trade agreements with countries that do not respect health, social and other conditions. "We should not have discussions with certain powers if they don't meet our criteria and we ought to have a consistent agenda", he said. "We need a global and shared framework and this framework should be based on cooperation and multilateralism. And absolutely not on a sort of a new hegemony or a fascination on new powers. 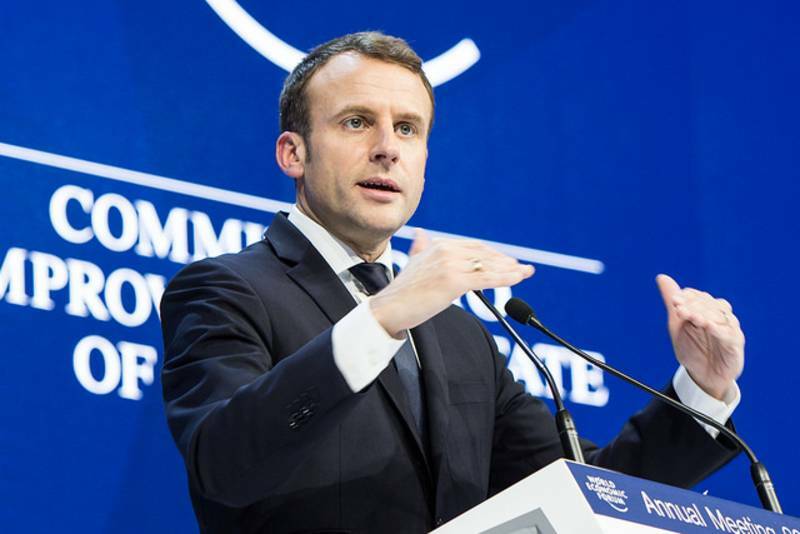 It would be a huge mistake", Macron said and added that the new compact is a unique way to protect the interests of all. "In a certain way, our new frontier is not geographical or a technological one but it's much more our commitment. We are our own frontier in our own conscience. Resuming this great idea of progress", he concluded and was heavily applauded. Powerful support for the liberal efforts of the Merkron duo came from across the Atlantic, from Canada Prime Minister Justine Trudeau. 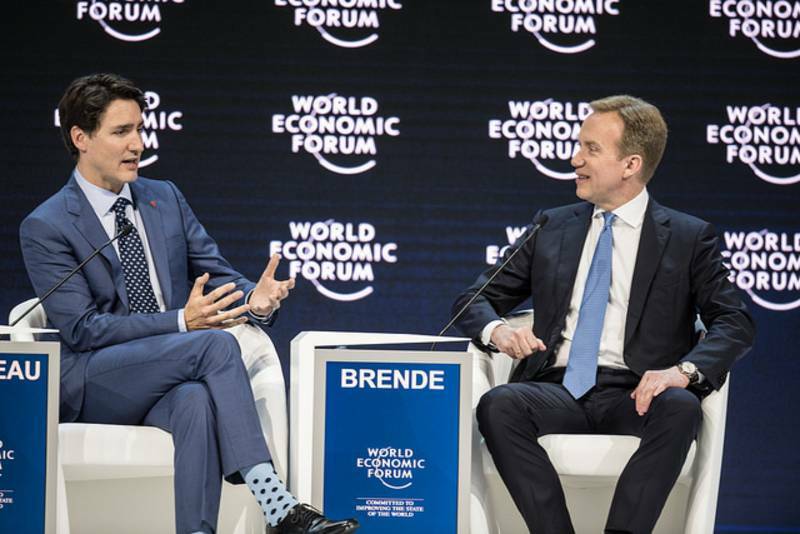 Again provocative with his socks, the Canadian liberal did not waste any time, and in the very beginning of his address announced that he would talk mainly about how important progressive values are in the context of globalisation. Before starting to talk, essentially about the same the German chancellor spoke about a day later, Justine Trudeau boasted the conclusion of a brand new comprehensive and progressive agreement for Trans-Pacific Partnership between Canada and the 10 countries left from the Trans-Pacific Partnership after the US left it under the leadership of Donald Trump. 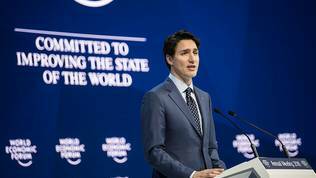 Justine Trudeau also believes that the world faces changes of the scale the industrial revolution provoked, and which will bring a dramatic shift of social, economic and political cultures. 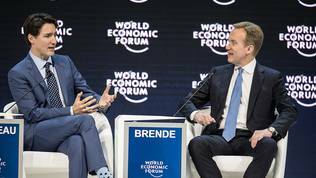 "This current step, involving automation and AI as the obvious examples, will totally revolutionise the world of work – in many ways, they already have", the Canadian premier said. To him, one of the solution to problems that will stem from such changes is gender equality. "I’m talking about hiring, promoting, and retaining more women. And not just because it’s the right thing to do, or the nice thing to do, but because it’s the smart thing to do", he said. According to data by the consultancy company McKinsey, reducing gender gap in Canada could add another 150 billion dollars to its economy by 2026. Trudeau quoted other studies that show that organisations which have women on their management boards, or where women hold leading positions, perform better than the rest. Increasing the share of women holding leading positions from 0% to 30% leads to a 15% growth of profitability, according to a research by the Peterson Institute for International Economics. And in the US, gender equality could add 1.75 trillion dollars to the American GDP. To Justine Trudeau achieving equal pay for the same work is just the tip of the iceberg. "Because equal pay for women does not mean equal opportunity, or equal treatment, or equal sacrifice. Paying a female employee the same as a male employee doesn’t even begin to touch issues around family planning, promotions, or job security. Women do more part-time work, and more unpaid work, than men", Justine Trudeau summarised. His solution is to work for removal of barriers before women at the workplace. "Removing these barriers will take effort, leadership, and a willingness to change the nature of work as we know it", he said. The Canadian premier paid a lot of attention to the Me Too campaign, focused on sexual harassment of women and violence in general. This movement as well as Women's March and Time's Up show that it is time for a critical discussion of women's rights, equality and the power dynamics of gender. 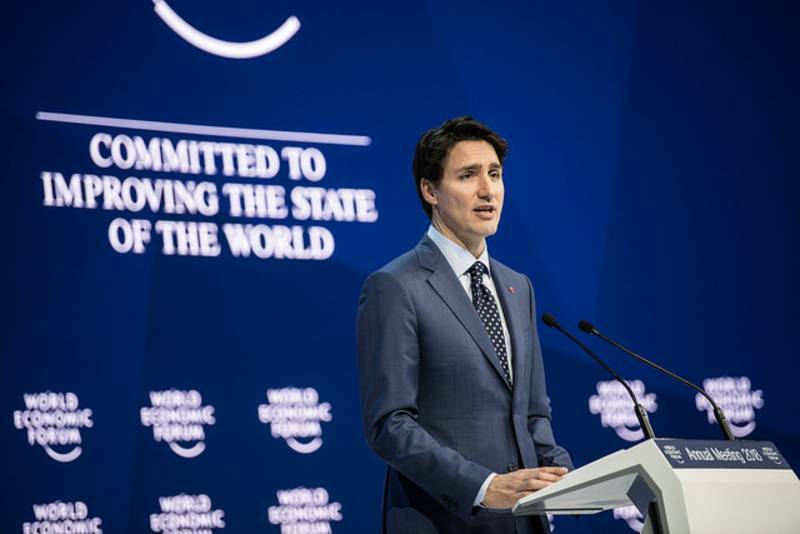 "Sexual harassment, for example – in business and in government – is a systemic problem and it is unacceptable", Mr Trudeau said and received strong ovation. "As women speak up, it is our responsibility to listen, and more importantly, to believe. Folks, treat these not as piecemeal alternatives to how things currently run. Treat these examples as a fundamental, essential shift in the way we operate", was Justine Trudeau's message. The issue of women's rights was one of the major ones at this year's forum in Davos. Against this backdrop, Donald Trump's speech was very narrowly knit. He spoke about what his government had achieved in the first year of the mandate, focusing on tax reform. He paid no attention at all on social change, digitalisation, or geopolitical change. His message was that America continues to be first on his agenda, but this does not mean it should do anything alone - "America first but not alone". He stands for ad hoc coalitions based on the principle of momentary interest. Humanity's progress is not within his sight.